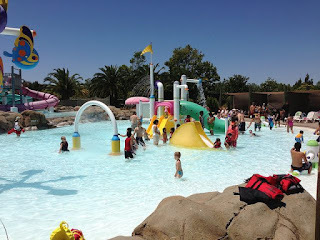 A Gospel driven Family: Do you love waterslides? Me too! Do you love waterslides? Me too! Something hit me today while we were at a local waterpark with the kids. Our four year old daughter Elly was playing in the kiddie area when my wife pointed out how quickly she found a friend. And I mean it was literally that simple. My daughter didn't care that this girl was a different skin tone or that her English was accompanied by a cute little accent a little different than her own (southern girls never lose that accent). Within a few more minutes the two of them were joined by a diverse group of other girls. "Do you love water slides? Me too! Let's be friends!" They didn't care about anything but playing together in the water. They didn't look at each other any differently because they found the one thing they immediately had in common and that was all they were concerned for. Hatred is a part of our sinful nature (Romans 3:23; Matthew 5:22). But specific hatred towards others because they are of a different ethnicity, language, culture, socio-econimic group, etc. is something that is taught. It's either taught by an immediate authority figure or by the environment into which we are raised. At some point when we embrace that specific sinful teaching we disregard the fact that every human being has been created in the image of God. We embrace superiority of self and elevate our supremacy above everyone else. But this group of little girls had not experienced such hateful teaching. They held hands, danced in circles, and waited for each other at the bottom of the slides. They laughed and splashed without a second thought of how different each of them looked or spoke. Could it really be that simple? With the Gospel...yes...yes it can be. Do you love Christ? Me too! Let's be friends! The views and reviews expressed in this blog are solely that of the author and do not necessarily reflect the convictions and personal views of others or their affiliated churches. If you wish to comment on this blog please feel free to do so as long as they are line with the rules stated on the tab above.